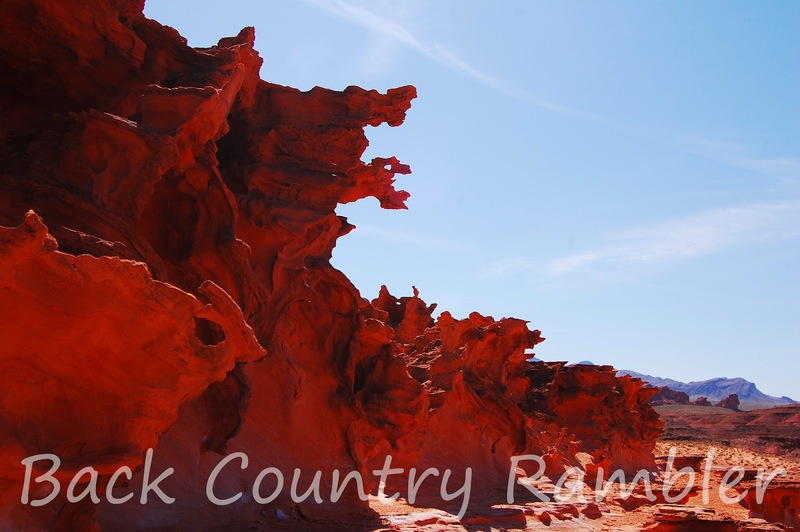 Devil’s Fire or Red Rock Springs found within the Gold Butte backcountry offers a surprising display of natural and cultural history painted against the vivid backdrop of the Southern Nevada Desert. These elements come together to create a contrasting portrait of color and culture. The seeps and springs that bubble up the precious desert resource sustains wildlife, vegetation and from time to time human existence. These same waters have helped to carve spectacular sandstone formations which conjure up such vivid names as Devil’s Fire, the Hobgoblins, Little Finland and Lone Palm. The vivid colors found within Red Rock Springs with the vibrant greens of the palm trees set against the bright reds and oranges of the sandstone is enough to get any backcountry rambler heading for the hills. 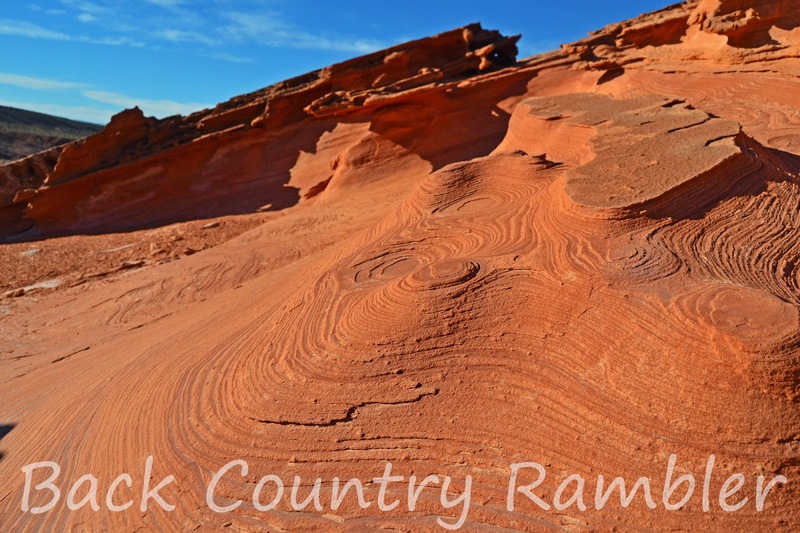 Red Rock Springs is a stop along the way of the Gold Butte Backcountry Byway. 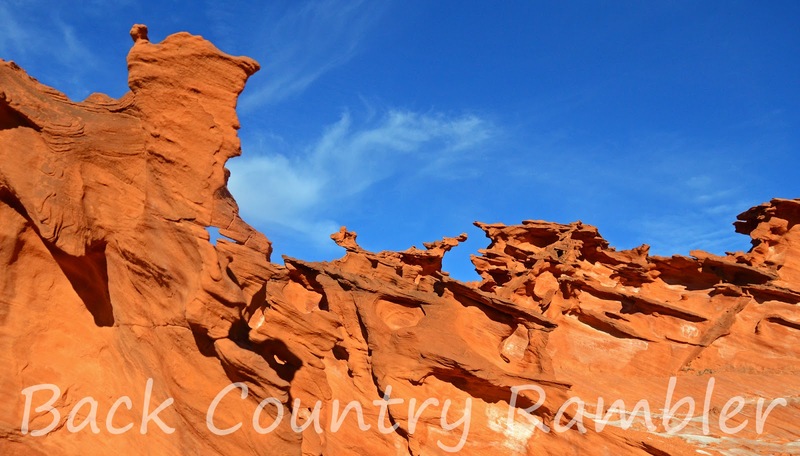 For specific information and pictures read Backcountry Rambler: Gold Butte Backcountry Byway. Other stops along the way to Red Rock Springs include Luke Whitney Petroglyphs, Whitney Pockets, Devils Throat, Mud Wash Petroglyphs and Keyhole Canyon. 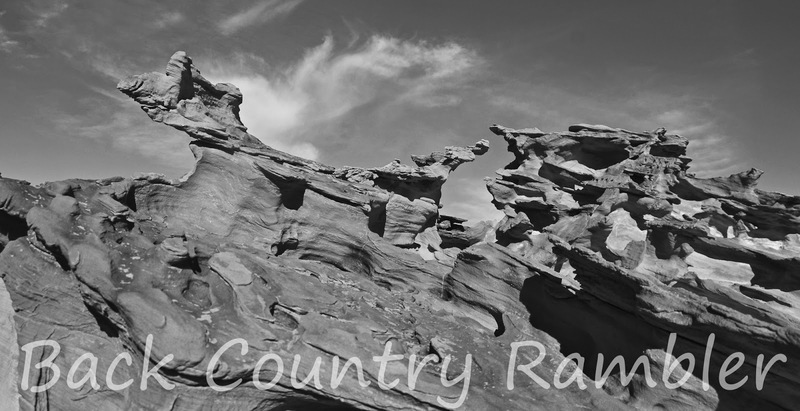 Click on any of the above links to find more information about these Backcountry destinations. To get to Red Rock Springs or Devil’s Fire turn off Riverside Road onto the Gold Butte Road. Continue down the Gold Butte Road for 21 miles until you get to Whitney Pockets. The road is paved to Whitney Pockets albeit rougher than a horny toads back. After Leaving Whitney Pockets you will continue down a dirt road for roughly 7.5 miles. You will then see the turn off to Devils Throat. After leaving Devils Throat you will continue down Mud Wash heading West for about 3.5 miles. You will then hit the Mud Wash Petroglyphs. After you leave Mud Wash Petroglyphs you will continue down Mud Wash until you see an old Cattle Corral. From the corral it is probably easiest to hike from here to get to the sandstone formations, palm trees and spring. You will see where other folks have made the hike over to the spring from this spot. You are just going up and down washes from this point and there is no official designated hiking trail so have good hiking boots and plenty of water. You can continue down the wash and circle back up to the palms but the road is badly washed out and you will need a high clearance vehicle to gain access coming this way. Red Rock Springs is known by many different names. Some of them that I have heard it called are Devils Fire, Little Finland and The Hobgoblins. This area is also known as Lone Palm and sometime lumped in with Red Bluff Springs. In the late 1800’s and early 1900’s Mud wash was the main route from the mines and ranches throughout the Gold Butte country to the railroad at the St. Thomas which was a spur off the Los Angles & Salt Lake Railroad. Two of my grandfathers, Stowel Whitney and Albert Frehner, traveled this route with their team and wagon freighting to and from the Grand Gulch Mine and St. Thomas. The route came up out of the Grand Wash, through the St. Thomas Gap, past Devils Throat and down into Mud Wash. This route continued down Mud Wash past Red Bluff Springs and down through the Red Bluff Springs narrows connecting into St. Thomas where the freight was weighed at the Gentry’s place. Hartman Tank is named after the rancher, George Hartman who ran cattle in the Gold Butte country in the early part of the 20th century. One of his more notable cowboys was Bill Garrett. Things were good in the early part of that century with plenty of rain and determination to make of go of it in this rough desert country. However after a few years of prolonged drought much of the feed dried up and the ranches did too. Most of the cowboys and ranchers moved on but Bill Garrett moved on up to Gold Butte with Art Coleman. For more information about these two good ol boys visit Gold Butte History. 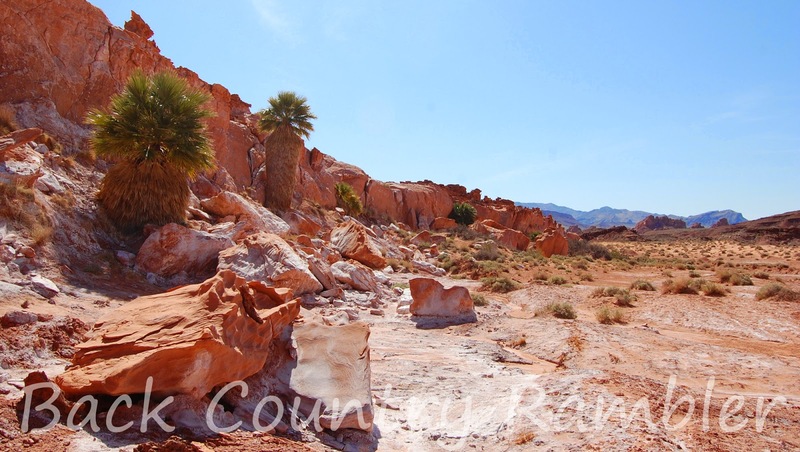 The corral in Mud Wash, acting now only as an identifier for the trailhead to Red Rock Springs, was once a gather point for the Spring and Fall weaning on the Gold Butte grazing allotment. The cowboys would push all the cows in the lower part of Gold Butte Wash and lower Mud Wash to this corral and use it to separate, brand and handle the cattle. The rest in this area were pushed to Gold Butte headquarters or the corral near the turn off to the Grand Wash Bay road known as Mud. My grandfather Don Whitney ran cattle on this allotment in the 1970’s and 1980’s. The evidence of earlier inhabitants of this area is marked by the many petroglyphs in the general vicinity. 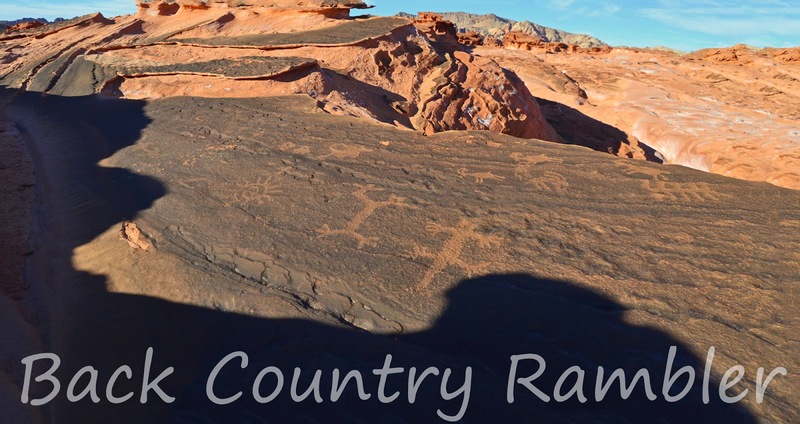 Mud wash, Kota circus, Keyhole Canyon, and the Luke Whitney petroglyphs which include the Falling Man, are just some of the petroglyphs in the area. The fallen fronds of these giant palms offer cover and a home to a variety of birds and small game. They are sustained by both the water and vegetation found against red sandstone cliffs from where the water seeps. 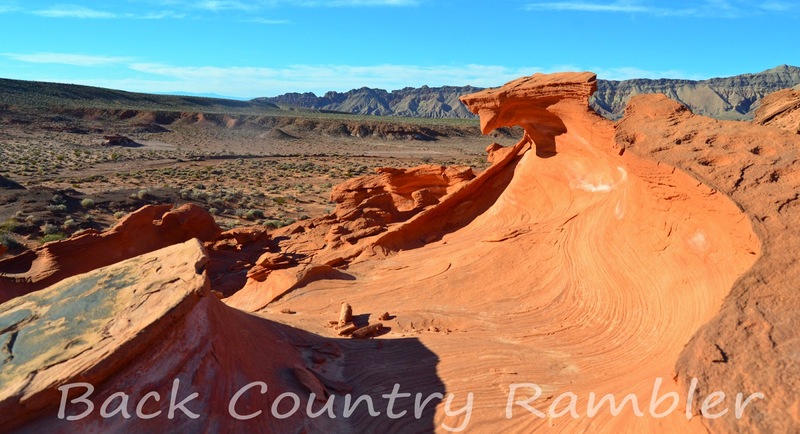 This seeming misplaced oasis in the Gold Butte desert offers the Backcountry rambler and spectacular view of nature and culture in the Southern Nevada Desert. 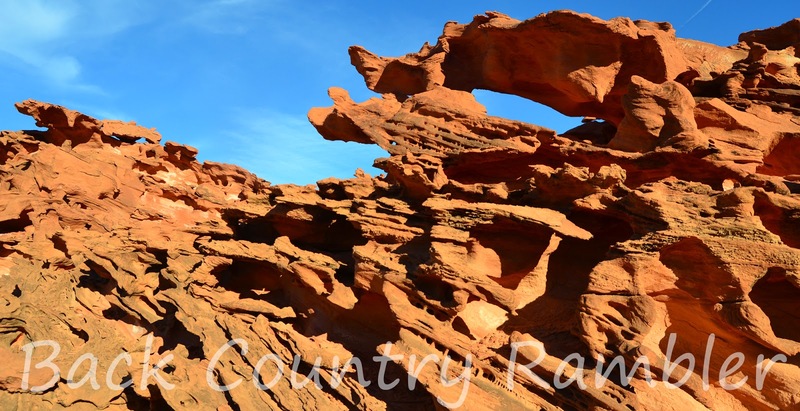 Be sure when visiting Gold Butte that you have good maps, plenty of water, plenty of spare tires and plenty of time to visit all of the backcountry destinations within the beautiful desert.